Harry on his way to the Nimitz from my back yard in New Jersey. He subsequently got his third green stripe. Updated update: Welcome, New York Times readers! It’s a Maplewood BlogolopolisTM trifecta! Candidate Obama called Afghanistan “the war we need to win.” Just last week, President Obama vowed to “finish the job.” In a prime-time speech on Tuesday evening, he intends to announce his plans for prosecuting the war, including whether he will supply the 40,000 additional troops requested by his hand-picked general, Stanley McChrystal. Prominent conservatives, pundits, and even a key foreign ally have all accused Obama of “dithering” over his decision, and thereby weakening troop morale and public support for the war. I share these frustrations to some degree, but I think it is still possible to turn the situation around with decisive leadership. The big question is whether such leadership will occur. The Nimitz, the oldest of America’s 10 Nimitz-class nuclear powered aircraft carriers, has been in service since 1968, making it about 20 years older than Harry. With a complement of more than 4,000, it’s a small floating city — the carrier’s welcome brochure notes that the Nimitz features a dental facility with five dentists (which seems like a lot, given the population). When he gets off duty, Harry usually goes to the gym or the library, where he can send emails from his military account. Harry, currently an E-3 Airman, is working toward promotion to petty officer as an Aviation Boatswain’s Mate (Equipment) — the folks who operate and maintain the catapults, arresting gear and other mission-critical equipment, enabling the aircraft to take off and land successfully. He works long hours, but likes the work and the people around him. He’s already suffered his first “war wound” — two stitches on the top of his head for a gash caused when he stood up too quickly while he was, I kid you not, swabbing the deck. Joking aside, there are real dangers involved in tending the powerful launching and recovery equipment, but I’m grateful that I don’t have to worry much about an enemy attack. President Obama, the brave men and women of the United States armed forces are looking to see if you are committed to victory in Afghanistan. On Tuesday evening, I hope you’ll start showing them that you are. Harry, be safe, and thank you for your service. This entry was posted in Uncategorized and tagged Afghanistan, Bush's Third Term, Harry, Military by Kirk Petersen. Bookmark the permalink. I'll add my thanks for Harry. My son is on the Nimitz as well. God bless the Nimitz and all the crew and may their commander in chief give them everything they need to complete their mission. My son also serves on the USS Nimitz. God Bless the Nimitz and her crew and all of our military at home and deployed. My son also serves on the USS Nimitz. God Bless them all in bring them home safely. I also found your link on Navy for Mom's, glad to have you on-board. 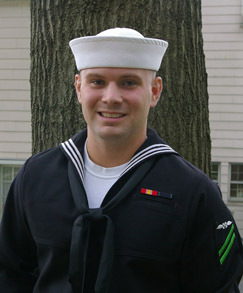 My son is not on a ship but at DLI and has been in the Navy for going on 9 years. Give your son a virtual hug and a big thank you for his service. Look forward to reading your blog and comments on N4M.